Using your personal library account enables you to check your library records for books you may have checked out, fines you may have, and any books you have requested. 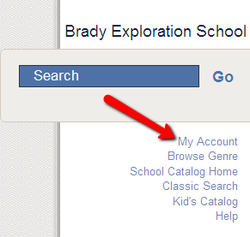 To access your account, you will use the library website home page, click on the book river and open it. On the right side of the page you will see "My Account" click on it. Log on using the box on the left "Use your library card/ID. Enter your Library ID (student ID), the PIN number is the last four digits of your ID. Select Log on at the bottom of the box. Your account will look similar to this page. Here you can see what items you have checked out, due dates, fines and more. What Lexile level is the book you are choosing? What are titles that fall within your Lexile range? Use this site to find books and levels.